Osteopenia dried plums belong in your diet. Even more so if you have Osteoporosis. Breaking news. New 2017 study reaffirms the value of dried plums (prunes) for building stronger bones. This new study concludes: "We end with the results of a recent follow-up study demonstrating that postmenopausal women who previously consumed 100 g dried plum per day during our one-year clinical trial conducted five years earlier retained bone mineral density to a greater extent than those receiving a comparative control." Bone-Protective Effects of Dried Plum in Postmenopausal Women: Efficacy and Possible Mechanisms byBahram H. Arjmandi, Sarah A. Johnson, Shirin Pourafshar, Negin Navaei, Kelli S George, Shirin Hooshmand, Sheau C. Chai,and Neda S.Akhavan was published in Nutrients May 2017. Yes, you read that correctly. Those dark, wrinkled fruits found on the grocery shelves next to raisins and dried apricots can improve your bone density! The research about Osteopenia dried plums (prunes) began in 2001 when scientists at the University of Illinois in Chicago published a paper about the growth, chemical composition and possible health uses of of Dried Plums or Prunes. The articles gives the history and composition of dried plums. Near the end they mention a number of health conditions that Dried Plums/ Prunes might alleviate. “Prunes are dried plums, fruits of Prunus domestica L., cultivated and propagated since ancient times. Most dried prunes are produced from cultivar d'Agen, especially in California and France, where the cultivar originated. After harvest, prune-making plums are dehydrated in hot air at 85 to 90 degrees C for 18 h, then further processed into prune juice, puree, or other prune products. ... Because of their sweet flavor and well-known mild laxative effect, prunes are considered to be an epitome of functional foods, but the understanding of their mode of action is still unclear. Dried prunes contain approximately 6.1 g of dietary fiber per 100 g,. . Prunes are good source of energy in the form of simple sugars, but do not mediate a rapid rise in blood sugar concentration, possibly because of high fiber, fructose, and sorbitol content. Prunes contain large amounts of phenolic compounds (184 mg/100 g), mainly as neochlorogenic and chlorogenic acids, which may aid in the laxative action and delay glucose absorption. Phenolic compounds in prunes had been found to inhibit human LDL oxidation in vitro, and thus might serve as preventive agents against chronic diseases, such as heart disease and cancer. Additionally, high potassium content of prunes (745 mg/100 g) might be beneficial for cardiovascular health. 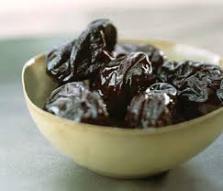 Dried prunes are an important source of boron, which is postulated to play a role in prevention of osteoporosis. A serving of prunes (100 g) fulfills the daily requirement for boron (2 to 3 mg). More research is needed to assess the levels of carotenoids and other phytochemicals present in prunes to ensure correct labeling and accuracy of food composition tables in order to support dietary recommendations or health claims. " I found this to be amazing information! Researchers at Oklahoma State University, USA took up the call for more research and they have published a series of articles about Osteopenia dried plums. Like most studies on bone loss, they began with rats. First they studied female rats whose ovaries had been removed and who already showed bone loss. Then they studied male rats who were deficient in gonadl hormones and had bone loss as a result. Both studies showed positive bone making results. The study of the females rats is most interesting because it showed a reversal of trabecular bone loss " dried plum improves trabecular microstructure of tibia after (bone) losses have already occurred." For the male rats they found "..that dried plum prevents osteopenia in androgen deficient male rats." Human subjects and dried plums. Osteopenia dried plums in postmenopausal women. In 2002 there was a study published about 58 postmenopausal women who were not taking hormone replacement therapy (HRT). "These were randomly assigned to consume either 100 g dried plums or 75 g dried apples daily for 3 months. Both dried fruit regimens provided similar amount of calories, fat, carbohydrate, and fiber. Serum and urinary biochemical markers of bone status were assessed before and after treatment. " "Only dried plums significantly increased serum levels of insulin-like growth factor-I (IGF-I) and bone-specific alkaline phosphatase (BSAP) activity. Higher levels of both serum IGF-I and BSAP are associated with greater rates of bone formation. Serum and urinary markers of bone resorption, however, were not affected by either dietary regimen. The results of this study suggest that dried plums may exert positive effects on bone in postmenopausal women." In 2006 scientists at College of Human Environmental Science published a study in the journal, Bone that showed "Dried plum prevents bone loss in a male osteoporosis model via IGF-I and the RANK pathway." In 2009 The journal Aging Research Review offers another article about Osteopenia dried plums. This article was written by researchers at the Department of Nutrition, Food & Exercise Sciences, Florida State University. The abstract of this articles state, in part,:"... As the demographic shift to a more aged population continues a growing number of men and women will be afflicted with osteoporosis and a search for potential non-pharmacological alternative therapies for osteoporosis is of prime interest. " " our initial animal study indicated that dried plum prevented the ovariectomy-induced reduction in bone mineral density (BMD) of the femur and lumbar vertebra. In another study, to mimic established osteoporosis, rats were ovariectomized and allowed to lose bone before the initiation of treatment. Dried plum as low as 5% (w/w) restored BMD to the level of intact rats. More importantly, dried plum reversed the loss of trabecular architectural properties such as trabecular number and connectivity density, and trabecular separation. "We have also shown the effectiveness of dried plum in reversal of bone loss due to skeletal unloading.[eg. bed rest etc.] Analysis of BMD and trabecular bone structure by microcomputed tomography (microCT) revealed that dried plum enhanced bone recovery during reambulation following skeletal unloading and had comparable effects to parathyroid hormone. In addition to the animal studies, our 3-month clinical trial indicated that the consumption of dried plum daily by postmenopausal women significantly increased serum markers of bone formation, total alkaline phosphatase, bone-specific alkaline phosphatase and insulin-like growth factor-I by 12, 6, and 17%, respectively." So Osteopenia dried plums treatment seems to be good news. Dried plums (Prunes) are available in most supermarkets. They are relatively inexpensive.